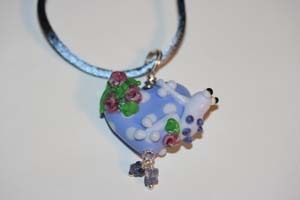 This is a moretti glass lampwork lucky frog on heard bead, handmade by U.S. Artisans. It has beautiful floral detail on the heart and the frog. It has a handmade sterling silver wire-wrapped loop that will fit any necklace. 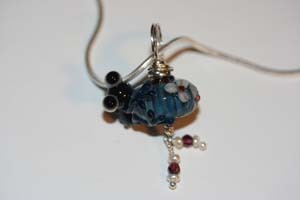 Onyx and garnet beads dangle below the heart. The satin cord necklace has a sterling silver clasp. Pictured right after the last frog necklace. 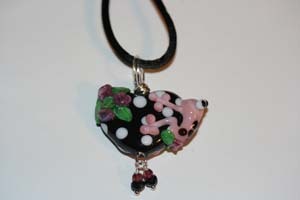 This is a moretti glass lampwork lucky frog on heard bead, handmade by U.S. Artisans. It has beautiful floral detail on the bead. It has a handmade sterling silver wire-wrapped loop that will fit any necklace. Garnet beads and freshwater pearl bead dangle below the heart. Comes with a sterling silver round snake chain. 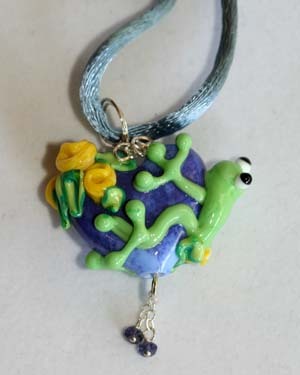 This is a moretti glass lampwork lucky frog bead, handmade by U.S. Artisans. It is encircled with a handcoiled sterling silver hoop so that the frog always sits up on the satin cord necklace with sterling silver clasp. Pictured right after the last frog necklace. 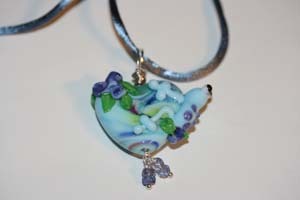 This is a moretti glass lampwork lucky frog on heard bead, handmade by U.S. Artisans. It has beautiful floral detail on the heart and the frog. It has a handmade sterling silver wire-wrapped loop that will fit any necklace. 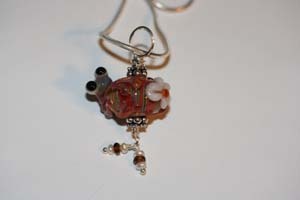 Ioloite and garnet beads dangle below the heart. The satin cord necklace has a sterling silver clasp. Pictured right after the last frog necklace. 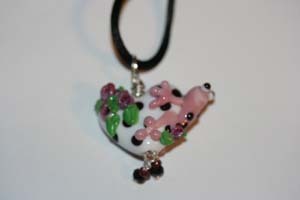 This is a moretti glass lampwork lucky frog on heard bead, handmade by U.S. Artisans. It has beautiful floral detail on the heart and the frog. It has a handmade sterling silver wire-wrapped loop that will fit any necklace. Ioloite beads dangle below the heart. The satin cord necklace has a sterling silver clasp. Pictured right after the last frog necklace. 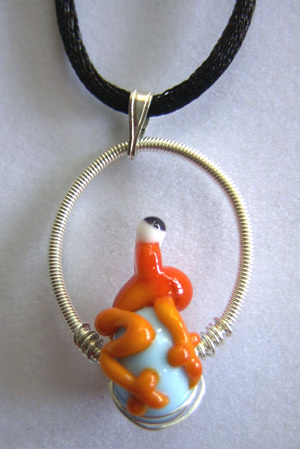 This is a moretti glass lampwork lucky frog on heard bead, handmade by U.S. Artisans. It has beautiful floral detail on the bead. It has a handmade sterling silver wire-wrapped loop that will fit any necklace. Garnet beads and freshwater pearl beads dangle below the heart. Comes with a sterling silver round snake chain.